Have you seen the new Strawberry Thief Bespoke Collection? 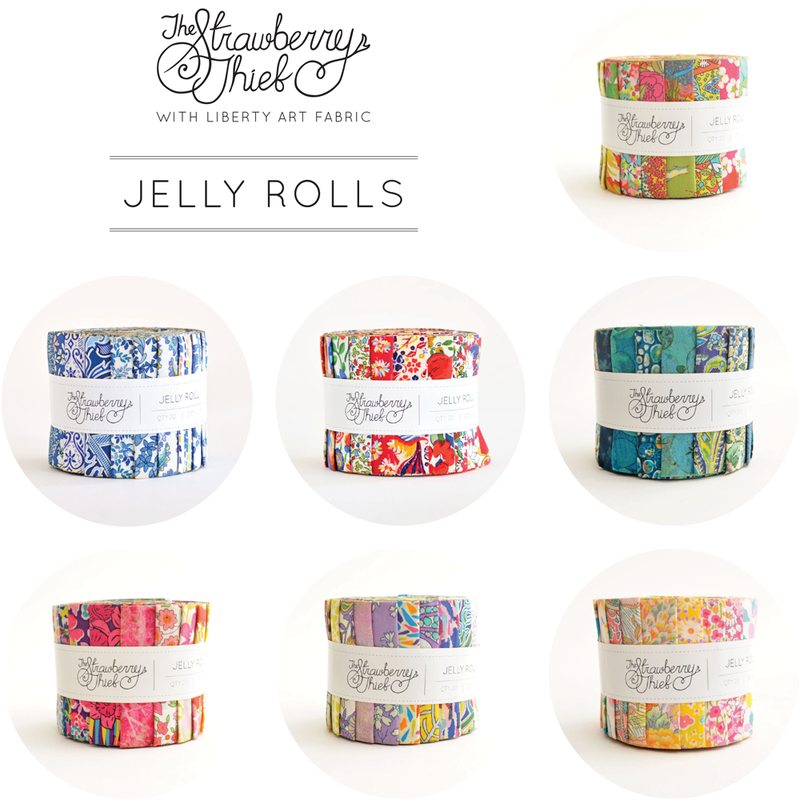 A beautiful assortment of Liberty Fabrics printed on to Tana Lawn exclusively for The Strawberry Thief. Read on below to find out more about this very special and exciting new collection, and click on the link at the bottom to shop! Good news Perth friends! We are going to be hosting afternoon Sit and Stitch sessions on Saturdays from 12.30-3.30pm at the Strawberry Thief warehouse! Our aim is to create a space where people can come and bring their current sewing project along, sit and stitch while having fun and also access the knowledge and advice of other experienced stitchers. We will also be running classes, bringing in teachers to share with you their specialised skills and techniques. This is a wonderful opportunity to get involved in the creative Perth sewing scene, learn new skills and meet like minded people! For our very first open day, Robyn will be running her very popular Hexie EPP class in the morning. The class will run from 10 – 12, with students invited to remain afterwards for the general Sit and Stitch. We will then be open to the public from 12.30pm – 3.30pm. Sit amongst like minded stitchers, ask advice and share stories and wisdom. Bring what you are working on or a new project to start! Tea/Coffee and biscuits provided, please feel free to bring a plate of nibblies to share. Under Robyn’s guidance, learn how to construct a hexie flower using English Paper Piecing techniques. You will receive a beautiful kit with everything that you need to begin your hexie journey/addiction – Aurifil thread, scissors, glue-pen with refill and enough pre-cut Liberty fabric hexies and papers to complete 5 flowers. The class will run from 10am until 12pm. Participants are then provided with a light lunch and invited to stay and take part in the afternoon Sit and Stitch, which runs until 3.30pm. We have limited spaces so bookings are essential. Please call (0400 933 902) or email us to book your place. The Strawberry Thief HQ is part of a factory complex, please park outside the gate and we will let you in! Did you know that we made and named our Greenery Bundle before the 2017 Pantone Colour of the Year, Greenery, was even announced? Yup, it’s true. I’m not saying it was a stroke of genius, or that we can predict the future, or that Robyn has enough power to influence the folks over at Pantone (but hey, I’m also not NOT saying any of those things!) – but it didn’t come as much of a surprise that Pantone went for an inspirational green colour this year. From lush indoor gardens that ooze relaxing vibes and are oh so on trend right now – to an increased eco-consciousnous coming to the forefront of global matters – it really is the colour green’s time to shine. And no wonder, being that green is a positive colour of balance and harmony – it relates to nature, growth, connectivity and endurance. Refreshing and revitalising – what better colour to reflect the fresh hopes and change we are hoping for in this new year? So let’s embrace the positivity of GREEN where we can! We have taken inspiration and updated our Greenery Bundle with of some of our favourite Liberty greens to soothe and INSPIRE you. Take a look for yourself! If you are interested in purchasing a bundle of the above fabrics as part of our new and improved Greenery Bundle, simply click here. Did you know that you can browse The Strawberry Thief shop by colour? To shop for all Liberty prints featuring green, click here. We also have a beautiful shade of green in our selection of Liberty Tana Lawn SOLIDS. Click here to view Green J. 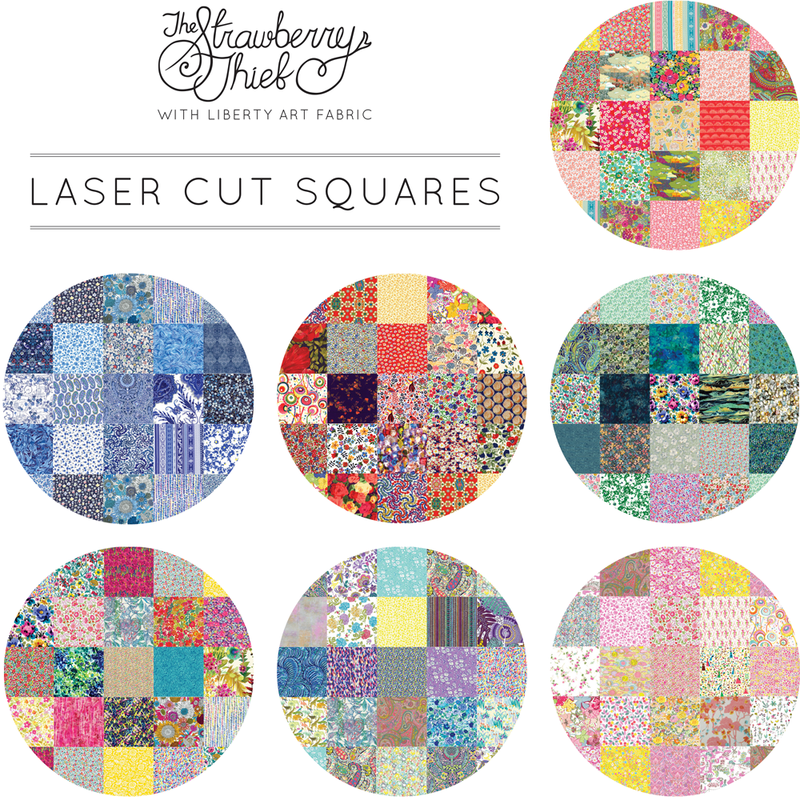 Introducing The Strawberry Thief’s take on a sweetheart quilt – the ♥ Love Liberty Quilt! ♥ Beautiful Liberty fabric, soft and fresh colours, sweet patterns… ♥ All the things we love most in one quilt! We couldn’t think of a better project to express our love for Liberty this Valentines day than by making one of these lovely heart quilts. Yes, we know, heart quilts have been done many times before in thousands of styles – but this V day we just wanted to adapt a simple pattern of sweet little hearts to show off the beautiful Liberty prints and let the different designs sing together! You can buy a Love Liberty Quilt Kit from our store if you would like to use the same fabrics as we did! It contains 32 x fat 16s in the colours shown above, as well as 2m of the background fabric, Mortimer. This is enough beautiful Liberty fabric to make the entire quilt top, including all the borders and the gorgeous scrappy binding. You can find out more and purchase it from our online store, here. 2. At the top left corner of all 3.5″ x 6.5″ rectangles, lay a 2″ square RST with the diagonal line pointed to upper centre of the rectangle. Sew on the line. Press seam on left side of all rectangles the same direction. Trim bottom 2 layers to 1⁄4″ seam allowance. Repeat this step for all of the 64 rectangles. 3. Repeat Step 2 by placing a 2″ square on the top right side of the rectangle with diagonal line pointed to the centre. Sew on the line, trim seam allowance, and press the seam in the opposite direction than the left side square in Step 2. Opposing seams will make it easier to piece the two sections together later. Repeat this step for all 64 rectangles. 4. Lay all of your beautiful matching rectangles in pairs side by side. Place a 3.5″ square RST on the bottom end of the left rectangle with diagonal line pointing to lower bottom right. As in Step 2, sew on the line, press all seams in the same direction and trim the bottom 2 layers to 1⁄4″ seam allowance. Repeat this by then laying a 3.5″ square on the bottom right side of the Right rectangle with the diagonal line pointing to lower left corner. You will want to press the seam in the opposite direction than that of the left rectangle, for ease when piecing. 5. After applying step 4 to all of your matching rectangles, you can now you can sew your pairs together! You should end up with 32 heart blocks all in all. 6. Referring to our diagram below, lay your quilt blocks out in 7 rows with the 3.5″ x 6.5″ background fabric rectangles in between each heart block. We tried to balance the layout of the blocks so that there was a good, even mix of bolder and softer coloured hearts throughout. Put the 6 mortimer rectangles measuring 5″ x 6″ at the beginning and end of the rows where indicated in the diagram. 7. Once you are happy with your layout, sew the blocks together in to rows. Then you can sew the rows together to make your centre block! 8. Stitch four of the 3.5″ strips of background fabric around the centre block to create the first border, and square it up. 9. Stitch the 34 x 6.5″ strips of your printed fabric together to make one long strip, then stitch this to the 1st border on the Centre Block to create a second ‘Scrappy’ border. Instead of making 4 individual pieces, I make one long border strip that I can just stitch down one side of the centre block, cut the rest of the strip off, stitch down the next side etc without having to measure and cut all of the pieces at the beginning. 10. Stitch the remainder of the background fabric in to one long strip to create third and final border, which you can then attach to the Scrappy border. 11. Lastly you will need to stitch the 34 WOF x 2″ strips from your fat 16s together to make your beautiful Scrappy binding. Fold in half and iron. Look at that lovely roll of scrappy binding you have made! Go you! Now you are ready to lay up your quilt and attach your binding in what ever way is easiest for you! HOORAY! I have just machine quilted mine (my first attempt at doing this EVER) and it went a bit puffy, as you can see in the photos, but I am hoping this will settle down after a wash. I will keep you updated when I add my bias – I ran out of time – but that could be worth doing a whole tutorial on itself! I hope that was easy enough to understand – feel free to ask any questions in the comments and I will try my best to help! Also, any advice for this novice machine quilter from you guys would be very helpful too! We have been busy behind the scenes creating a beautiful new range of pre-cuts, and it is with great excitement that we are finally able to share them with you. 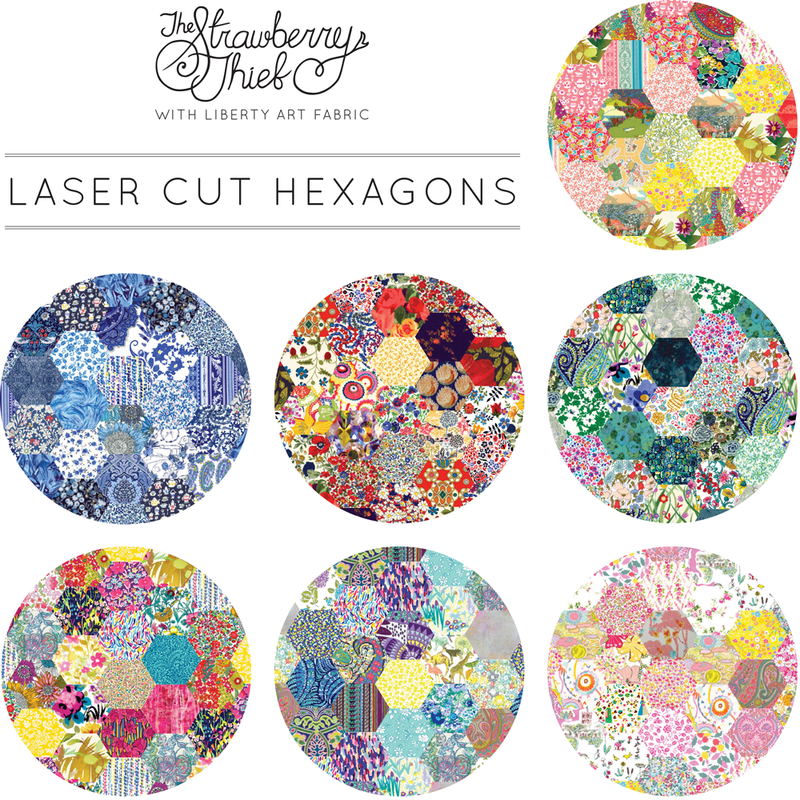 Laser cut Liberty fabric packs take the prep work out of patchwork and let you get stuck straight into the stitching! Available in jelly rolls, hexies, charm squares, layer cakes and bias binding, in carefully curated colourways – we are completely besotted with them and we know you are going to love them too! Available in 1″ and 2″ sizes and seven carefully curated colourways! A quarter inch seam allowance is added to finished sizes. 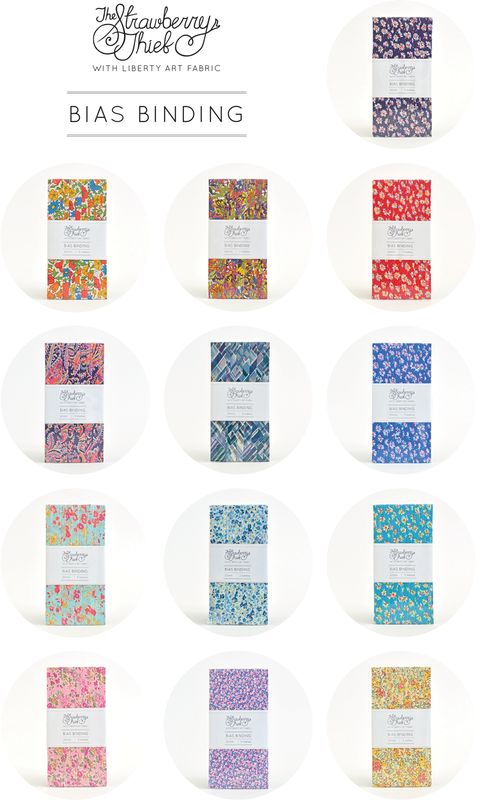 Available in 5″ charm packs and 10″ layer cake packs in seven carefully curated colourways! Jelly rolls in seven carefully curated colourways. Each jelly roll includes 20 strips measuring 2.5″ x 54″. Bias binding is perfect for finishing your quilting projects and is available in 13 designs from the Liberty art fabric collection.